Babies and toddlers are known for being shy. At home, they might be off-the-wall and singing at the top of their lungs, but as soon as they step in front of a crowd of strangers – or family members at the holiday party – they clam up and pretend they cannot speak. Unless parents take an active role in raising children to act with courage, they will do what most kids do and shrink into themselves when presented with a chance to shine. However, Drake Grillo is no ordinary toddler. 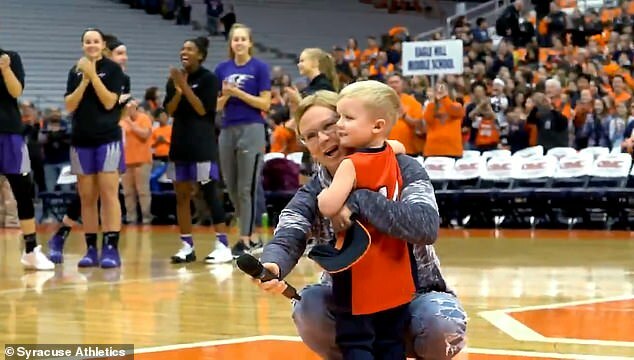 When he was asked to get in front of a crowd of thousands at a recent Syracuse Women’s basketball game, he did so and then proceeded to sing the national anthem at the top of his lungs. Because the boy is only three-years-old, his ability to sing the national anthem got the crowd very excited. It’s no wonder the women’s team went on to win the game by more than fifty points. In the video, watch young Drake take to the court with a massive microphone in his hand. He then stands with 6,000 pairs of eyes fixed on him and sings the national anthem for the fans at the Carrier Dome. And not only does he nail his rendition of the Star Spangled Banner, but he is also a three-year-old doing it. Many American adults do not even know all the lyrics to the national anthem, let alone children who are only three. As the boy went through the whole song, he finished with a flurry of notes. And after he was done, the crowd in Syracuse rewarded him with a standing ovation and an avalanche of applause. 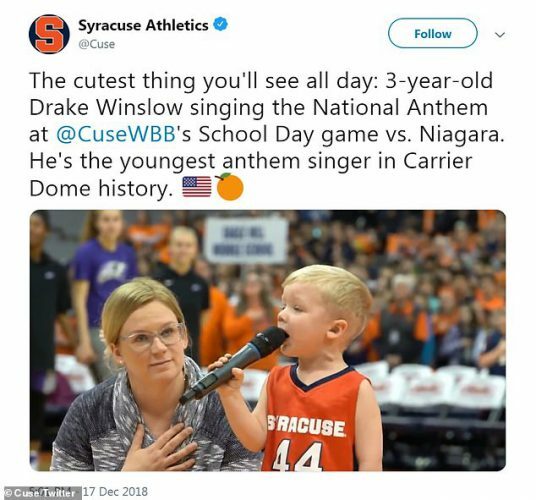 When Drake Grillo finished singing the anthem, basketball team members from Syracuse came over to congratulate the boy. They held out their fists and gave the boy fist bumps to show they appreciated his voice and his performance. Drake might not have understood the magnitude of his accomplishment, but adults in attendance sure did. As it turns out, Drake’s performance was a record breaker for the stadium. He was the youngest person ever to sing the national anthem at the Dome in the stadium’s entire history. Not only can Drake sing, but he also loves performing. He is a sports fan through and through as well. And he has a lot of pride in the United States. Drake practices singing with his toy microphones at home. And his favorite song is always the Star Spangled Banner. But this was not even his first time singing it at an official sporting event. During the summer, he sang the anthem for a minor league baseball team in Auburn. What do you think about this toddler’s rendition of the anthem?